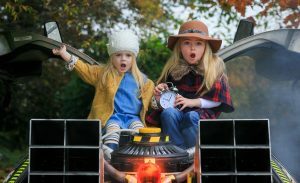 On Sunday October 29th at 2am the clocks went back and the famous DeLorean Time Machine from Back to the Future came to Edenderry for a quick pitstop to meet little Christian Doyle (3) and Maisie Smyth (3) from Edenderry. The extra hour makes mornings slightly lighter and evenings darker. Some spent an extra hour in bed and others got out and embraced the day but an interesting fact is that the whole concept of daylight saving was actually introduced in 1907 by the great-great-grandfather of Coldplay singer Chris Martin! William Lillet published a pamphlet called ‘The Waste of Daylight’ in a bid to get people out of bed earlier by changing the nation’s clocks. Willett then spent the rest of his life trying to convince people his scheme was a good one. Sadly, he died of influenza in 1915 at the age of 58; a year before his clock-changing plan was adopted by the Germans and the UK in 1916. His great-great grandson, Chris Martin however has had huge success with smash hits ‘Clocks’ and ‘Daylight’ perhaps inspired by his forefather! 1. There are still many homes in Ireland that have old incandescent light bulbs hiking up their energy costs; or stocks of them in the cupboard. The old bulbs are very wasteful as 90% of the electricity they use produces heat rather than light. Energy efficient alternatives not only save money on electricity bills but also help to protect the environment. Check all bulbs in use and start changing now as the savings will more than pay for the replacements. 2. Turn the lights off when leaving a room and use “task” lighting rather than whole room lighting when only a small amount of light is required. Regularly clean light fittings, reflectors and lampshades. 3. Most energy efficient light bulbs, such as Compact Fluorescent Lamps (CFLs) and halogen light bulbs, are available in various configurations and although they cost more to purchase, they are far more energy efficient thus reducing electricity costs. For example, a CFL light bulb uses 80% less electricity than an equivalent incandescent light bulb and typically lasts eight to twelve times longer. 4. Replacing 3 x 100W incandescent light bulbs with CFLs using 3 hours of electricity per day can save an average household up to €43 per annum. 5. Outdoor decorative lights look great when lighting up trees or garden features. However, it might be worth considering only switching them on occasionally to help reduce your energy bill. Solus is an Irish owned company that has been established for over eighty years and now supports 63 jobs in Ireland. The company is constantly investing in new product development and the manufacturing & application of innovative lighting solutions including next generation LEDs. Solus is committed to providing a complete range of energy saving lighting products for all applications possible. This has enabled consumers to be confident in knowing that they can rely on Solus to supply their lighting needs well into the future at competitive prices.